Not very long ago, black rice (Oryza sativa) was forbidden in China. Not because it looked poisonous for its black colour, but because it had high nutritional values, and could be given a place only on an emperor’s menu. 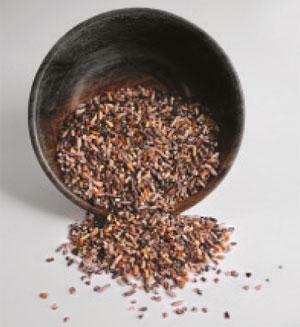 For centuries, the nutritional values of this wild rice eluded common people. Now researchers have begun to study the sticky varieties of black rice and found that it has several medicinal and nutritional values. It protects from cancer and soothes inflammation due to allergies and asthma. Black rice is indigenous to the Northeast, West Bengal, Jharkhand and Odisha. In Manipur, it is considered food as well as part of traditional medicine. Called chak-hao, it is consumed during community feasts. The rice water too is used to wash hair to make it stronger. 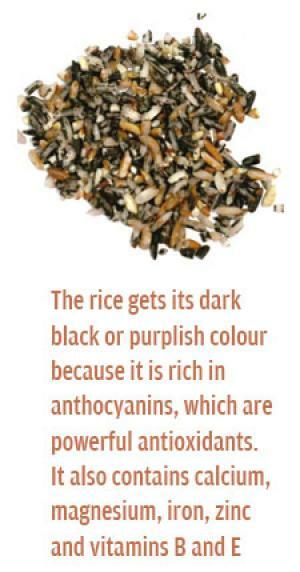 The rice gets its dark black or purplish colour because it is rich in anthocyanins, which are powerful antioxidants, says Dinabandhu Sahoo, director of Institute for Bioresource and Sustainable Development (ibsd), Imphal. “The rice contains more vitamin B, niacin, vitamin E, calcium, magnesium, iron, and zinc compared to white rice. Rich in fiber, the grain has a sweet and slightly nutty taste. It is used as an "unmilled rice"—the fibre-rich black husks of the rice are not removed,” he says. ibsd is conducting research to map the genome of the rice variety which grows in Manipur. Research shows that anthocyanins not only act as antioxidants, they also activate detoxifying enzymes, prevent cancer cell proliferation, induce cancer cell death, have anti-inflammatory effects, inhibit the formation of new blood vessels that encourage tumour growth, prevent cancer cell invasion and induce differentiation of cells which makes them less likely to grow and spread, says a research published in the Asia Pacific Journal for Cancer Prevention in 2014. Though grown in several countries, the origin of black rice is unclear. 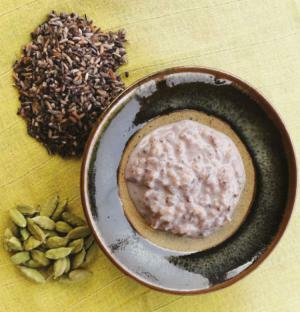 Crop scientists in Japan, whose research was published in September 2015 in The Plant Cell, found that ancient humans grew certain varieties of rice for their nutritional and medicinal value through crossbreeding. Researchers discovered that the traits in black rice arose due to a rearrangement in a gene called Kala4, which activates the production of anthocyanins. “The birth and spread of novel agronomical traits during crop domestication are complex events in plant evolution,” says the study’s lead scientist, Takeshi Izawa. Black rice farming is a low-water, labour-intensive, organic method that uses young seedlings singly spaced and typically hand-weeded with special tools. Potshangbam Devakanta, a Manipur-based farmer who has been farming about 100 traditional varieties of paddy, says that black rice is drought-resistant. It is also a part of the traditional Manipuri diet and is locally called chak hao poireiton. Though figures for total black rice grown in Manipur are not available with the state government, ibsd officials say it is sold in the local markets for as much as R300 per kg. ibsd’s Sahoo says black rice only contributes around 10 per cent of the total rice cultivation in Manipur due to its poor yield. However, the state agriculture department is now vigorously pursuing the System of Rice Intensification, a methodology aimed to increase rice yield. The department is urging Manipuri farmers to stop jhum or slash-and-burn farming to claim agricultural land and adopt this technique to minimise the cost of production. Rinse the rice and soak in water for about six hours. Drain the rice and transfer to a saucepan with the milk. Bring the rice to a boil, reduce the heat and simmer, stirring frequently for about 30 minutes or until the rice is tender. Add sugar and cook for five more minutes. Stir frequently. Garnish with cardamom and remove from the heat. Serve hot or cold. I am a farmer from Nagpur (Maharashtra) looking for black rice paddy seeds!